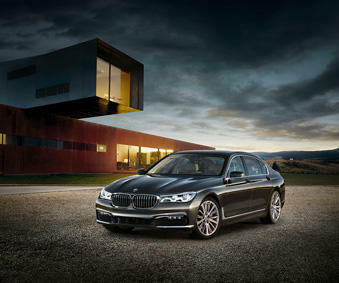 The 2016 BMW 7 Series is a pure beast on the road. It comes with a large and powerful 3.0-Liter 6-Cylinder engine that produces an impressive torque of 330 lb-ft and horsepower of 320, while maintaining an excellent fuel-efficiency of up to 21 MPG in the city and 29 on the highway. The vehicle’s revolutionary lightweight Carbon Core creates a low center of gravity to improve overall speed and agility. Using a combination of aluminum, carbon fiber-reinforced plastic (CFRP), and ultra-tensile steels, BMW has managed to cut up to approximately 90 pounds of the vehicle. The hood and doors of the 2016 7 series are made of lightweight materials, like aluminum, to improve overall aesthetic design. The entire outer body of the 2016 BMW 7 Series is remarkably clean and has a sportier sedan look that has been reestablished with the current 5-series and 3-series models. Inside the 2016 BMW 7 Series, there are several new design elements and themes that can be noticed, which are uncommon in other sedans. There’s more bright work in the interior. The instrument panels get a more horizontal and shelf-like appearance (making it easier to access vehicle features and entertainment options), and new seats have also been installed that are more comfortable than ever. Although the crash test results from NHTSA and IIHS are yet to be revealed, the 2016 BMW 7 Series is an incredibly safe vehicle, featuring numerous safety features for maximum passenger and driver protection. Some of these include 4-wheel ABS, brake drying, tire pressure monitoring systems, adaptive headlights, cruise control, stability control, traction control, emergency braking assist, and engine immobilizer. So, if you are looking for a vehicle that offers maximum performance, safety, and durability, with an amazing exterior, the 2016 BMW 7 series is definitely worth buying. You can visit Budds’ BMW for buying or taking the vehicle out for a test drive. For more information, buying advice, and accessories prices, you can also contact Budds’ BMW here.